Rebecca Weeks reflects on Ian Whitfords three-part video. Made originally for BOS08, it was filmed and shown originally in Bosigran, near Zennor. Whitfords Triptych, focused as it is upon the Captain's Cottage (now a holiday home in Bosigran), forces us to consider the meaning of the cottage and the meaning of any inhabited building or dwelling in relation to its function in housing people. Through the work we come to understand the necessity of the dwelling as the site through which we are at peace, through which we stay peacefully in a place. Heidegger wrote of dwelling as an integrated process of being through which things around people are preserved, and through which a balance is maintained. This interrelationship between people and the place in which people dwell is part of what makes them people.
" mortals nurse and nurture the things that grow, and specially construct things that do not grow. Cultivating and construction are building in the narrower sense. Dwelling, insofar as it keeps or secures the fourfold in things, is, as this keeping, a building." In Whitford's work we understand the significance of dwelling through its absence. We appreciate the worth of a place to dwell in through its lack. 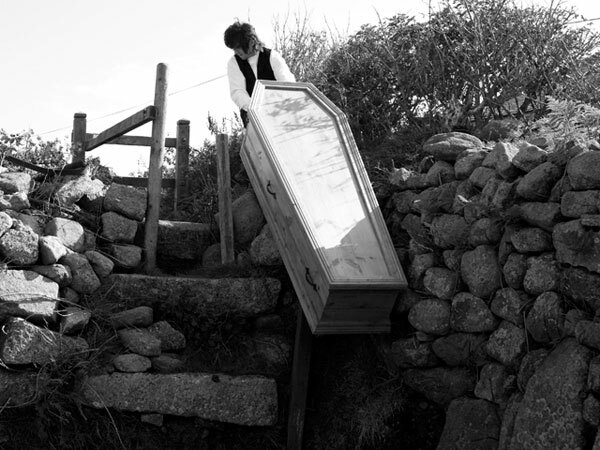 In the narrative played out before us in the sequence of videos an unaccompanied man (as perhaps the last member of the community who must bury himself) drags a coffin along the coffin path from the cottage to Zennor church; a woman knocks at the door of the cottage to no avail; and the cottage stands empty. These images communicate loss; the loss of a place to dwell. This is not just about the loss of property but about the inability to access shelter physically and psychologically, the inability to access wellbeing and the fracturing of an interdependency between people and place that stretches back into the past across the generations. Whitfords' work raises questions about the impact of that fracturing upon places, upon local communities, upon individual psyches and identities and upon contemporary culture generally. In conversation with the artist it becomes apparent that the themes in this work have been considered over many years and that the artist is not commenting from a removed perspective but from the perspective of a Cornish man who grew up in a Cornish village who has witnessed the loss of the community and the place he grew up in. The place he knew and loved no longer exists for him; when he returns he is greeted by the people who now live there as an outsider. There is no one to share the sense of this loss with, there is no one who remembers how things used to be. His great grandmother's home is now a holiday cottage. It is all too easy to look back at the way we lived and romanticise it, forgetting the hardships, the toil, and the material poverty but Whitfords' work cannot be reduced by a critique of nostalgia. 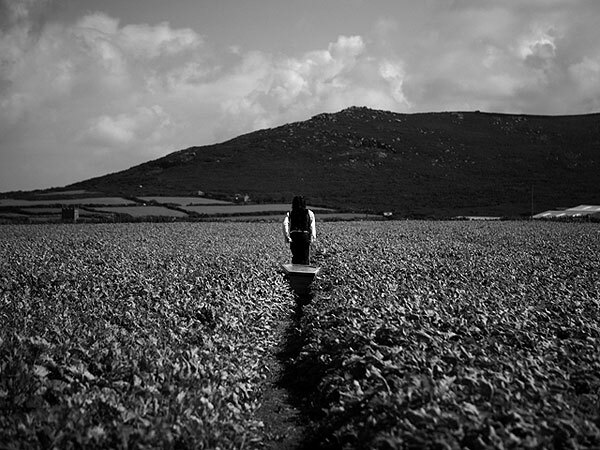 The difficult dragging of the coffin from the fields onto the roads and into Zennor marked by the transition from silence and black and white video to sound and colour video highlights the tension in this work between the past and the present. It is a tension around dispossession and the need for a sustainable future that is increasingly urgent in contemporary Cornwall.